I tried to read Ender's Game, but two things kept me from finishing. First, school became simply too burdensome for me to take on anything else. Second, I couldn't get into the story of this brilliant but troubled child trained for war. However, I did remember parts of the novel while watching Ender's Game, and I was surprised by both how close the film stayed to my memories and how on the whole the film worked. Ender's Game has not been successful, and I cannot figure out why. It has an interesting story, it's well-acted (mostly) and has some strong moments of tension while asking questions of morality in war. Earth was attacked by aliens and was on the verge of conquest when Mazer Rackham led a suicide mission that destroyed the mothership and saved humanity. Ever since then, Earth has prepared for a reencounter with the aliens, and as part of that strategy they prepare their brightest and youngest to train in Battle School if they are seen to be endowed with great intellectual and military powers. Among those students is Ender Wiggins (Asa Butterfield), a bright but highly troubled student. He is the third child in the family, a rarity on Earth (requiring special permission I think). Ender is psychologically somewhere between his hot-headed brother Peter (Jimmy 'Jax' Pinchak) and his sweet and sensitive sister Valentine (Abigail Breslin). Ender is a genius in strategy, attracting the attention of Colonel Graff (Harrison Ford). He gets Ender to go to Battle School, even if psychologically Ender wavers. In Battle School, Ender both rises and falls. While his abilities are not in question, his nature is not as brutal as Graff hopes for. There is also the matter of leadership: he quickly goes from the lowest levels of training to joining a squadron, the Salamanders, headed by bully Bonzo Madrid (Moises Arias). Ender does befriend Petra Arkanian (Hailee Steinfeld), one of the few women at Battle School. While Ender does well, he is constantly being held back by the vindictive Bonzo. Graff, however, decides to reactive an old Squadron, The Dragons, and even lets the now-Dragon Commander Ender select his army. Now we see that Ender is more than capable of leading whole armies, though whether he is emotionally capable of that is still in question. There is a struggle between the compassionate psychiatrist Major Anderson (Viola Davis) and Graff. Ender, however, lets his rage get the better of him. In a confrontation with Bonzo, who has been ruthless in his actions against Ender, gets into a physical fight in the showers with Bonzo, which causes a terrible accident. Guilt-ridden, Ender leaves, but then is persuaded to return by his sister, with whom he is still close. Graff, now with his Dragon leader ready, take them to a former colony to complete his training. We get a shocking twist: Rackham is not dead. Rackham (Ben Kingsley) will be his mentor as Ender and his Dragons play war games. Most of the time they win, and at least once they lose when Ender micromanages his team. However, in the end they do win the ultimate victory when Ender decides to destroy the entire planet of the aliens in order to be victorious. It is only after he and his team have won that they are told the truth. These were not simulations. These were the real battles, with real casualties, and most importantly, with real extermination. Ender, so horrified by his actions, follows the dreams he has been having to venture outside the protective bubble on the former colony to find an egg of the aliens he's destroyed, and now will venture to place it somewhere safe. I'm not too bothered by the idea that Ender's Game suggests a sequel given that Orson Scott Card's novel is the first in a series. I can't say that it is a violation of one of my Golden Rules of Filmmaking: Never Suggest There Will Be A Sequel. However, it is up to the audience (particularly those who haven't read or heard about the mythos of Ender Wiggins) to decide whether leaving such an open-ended conclusion to the film is a good idea or not. I again cannot say whether the film stays close to the source material. Instead, let me focus on the aspects that I thought worked. First, we have some excellent performances. Butterfield has grown up considerably since I last saw him in Hugo. Here, his expressive eyes showed a young man, bright but troubled, struggling between what the adults wanted him for and how he could bring himself to overcome his own trepidations. Ender Wiggins isn't a hero per se; he's a survivor, someone who has the intelligence to outwit his enemies but not able to control the rage within him. I imagine that in the novel he struggles between the fighting nature of his brother and the gentle nature of his sister, but in screenwriter/director Gavin Hood's adaptation that had to be a bit more opaque. Yet I digress. Butterfield captures the contradictory nature of Ender: the boy who is a tactical genius but who is still at the end of the day, a boy attempting to fit in and be liked. The constant tug between both aspects of his nature is compelling to watch, and it is good to see Butterfield working so well to integrate himself in roles that see him shift from boy to man. Harrison Ford was equally strong as Graff, a commander who sees nothing other than a way to win the ultimate victory regardless of the cost. Ford plays the part correctly: that of the determined warrior, and I thought that this is another excellent performance in an excellent year for him in two great films (this and 42). While Kingsley's Maori make-up might be jarring I think it shows an effort to have a more open declaration of other cultures. On the whole I think both Steinfeld and Breslin worked well as the best friend and sister of Ender. Steinfeld might not have had the greatest role but she shows that she can act (which had those watching Romeo and Juliet in doubt). About the only real weak link acting-wise was Arias. His height isn't his fault, but his 5'1" figure is so jarring whenever he comes up against anyone (in particular the 5'10" Butterfield) that it almost comes across as comical. Even worse, Arias devours the screen with his wild overacting that it becomes sad to watch. The visuals work so well, in particular when the Dragons begin a series of attacks. Without any 3-D effects, the screen is so filled with the spaceships and the children leading the attacks that we feel as if we are actually there. I do find some things not to my liking. There is Steve Jablonsky's music, which at times felt like it was borrowing from The Dark Knight. I also found that while at times Donald McAlpine's cinematography worked well, at times the camera work (in particular whenever the teams were in the Battle Dome) was making me seasick. Yes, the Battle Dome sequence was beautiful, but it was also a bit nauseating. These, however, are minor points. I was highly impressed with Ender's Game. It allows the deep questions of the novel (the morality of destroying a whole planet/civilization to save your own) is not short-shifted. After learning the truth of the final battle Ender shouts that the way we win matters, something that sometimes we don't ask in this era of perpetual war. 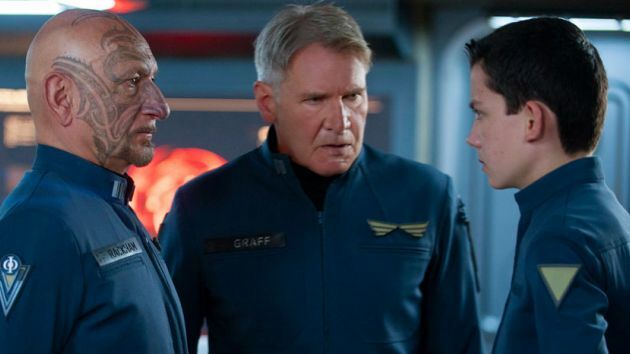 The film has great performances and excellent visuals, and I think the best compliment I can offer in regards to Ender's Game is that it is the type of film that makes one want to read the novel. Ender's Game is at the top of my must rent list. Glad to hear the movie does not disappoint. Too bad it did not do particularly well at the box office though.